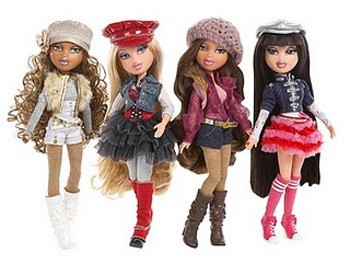 On November 10, 2010, Bratz Dolls celebrated their 10th anniversary with special edition Bratz Party Dolls. These dolls are totally the life of the party – they always bring their sassy spirit, signature style and awesome attitudes to any get-together! The new Bratz Party Dolls are fully poseable and jointed in a new way that makes moving them in different positions even easier than before. Plus, they come with an assortment of jewelry, two complete outfits and a special code to unlock tons more fun online at www.Bratz.com. And for all of you die-hard Bratz fans, Bratz also has a YouTube Channel where you can view their commercials and their brand-new webisodes (like the one posted below)!